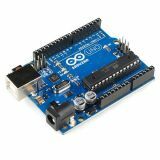 ARDUINO is a hardware and software company that produces PC boards, components and modules with diverse functions and application. The company's PC boards includes serial data interfaces, sometimes with USB port for programs loading directly from PC. Development board ARDUINO UNO REV3 ArduinoUno is a microcontroller board based on the ATmega328P. It has 14 digital I/O pins (of which 6 can be used as PWM outputs), 6 analog inputs, a 16 MHz quartz crystal, a USB connection, a power jack, an ICSP header and a reset button. Development kit ARDUINO MEGA2560 REV3 The ArduinoMega 2560 is a microcontroller board based on the ATmega2560. It has 54 digital input/output pins (of which 15 can be used as PWM outputs), 16 analog inputs, 4 UARTs (hardware serial ports), a 16 MHz crystal oscillator, a USB connection, a power jack, an ICSP header, and a reset button. Development kit ARDUINO Motor Shield REV3 The Arduino Motor Shield is based on the L298, which is a dual full-bridge driver designed to drive inductive loads such as relays, solenoids, DC and stepping motors. It lets you drive two DC motors with your Arduino board, controlling the speed and direction of each one independently. You can also measure the motor current absorption of each motor, among other features.